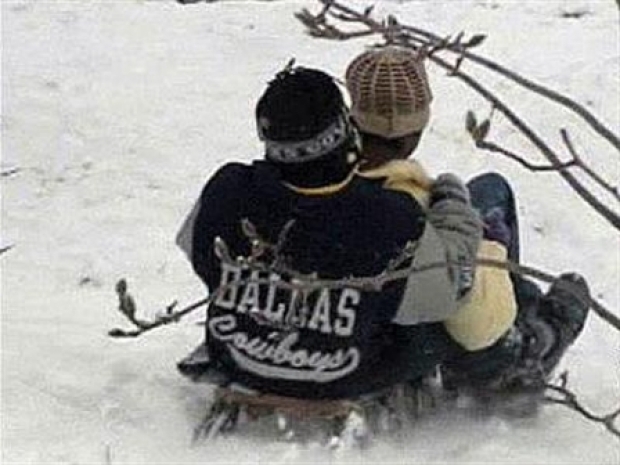 WASHINGTON -- A winter storm warning meant one thing for the D.C. area: snow day! Well, except if you attend D.C. Public Schools. Students trudged to class after a two-hour delay. The D.C. government is operating under a liberal leave policy. More closings and delays already are in place for Tuesday. For the current list of school closings and delays, click here. The storm warning expired at 2 p.m. Monday. 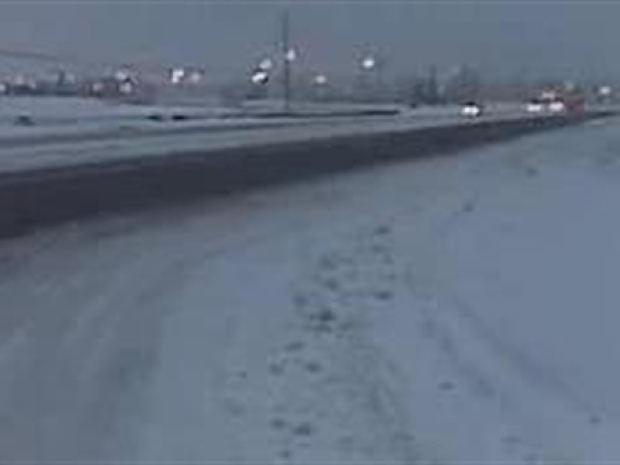 Snow video from Route 228 in Waldorf, Md. In Maryland, the communities of Royal Oak in Talbot County and Port Republic in Calvert County each reported the largest amounts of snowfall in the region -- 12 inches, according to the National Weather Service. 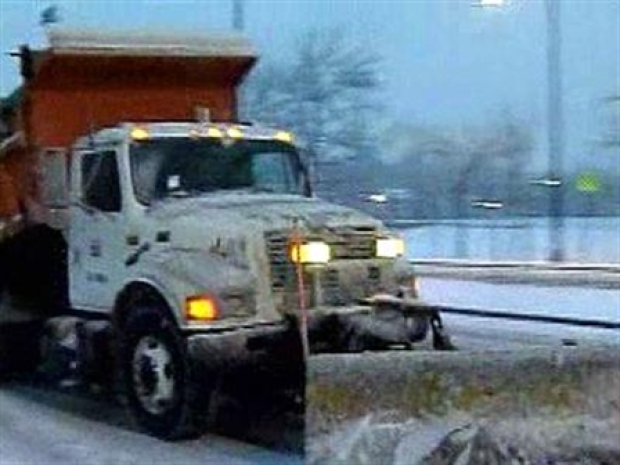 Snow emergency plans were in effect across much of Maryland because of the winter storm. 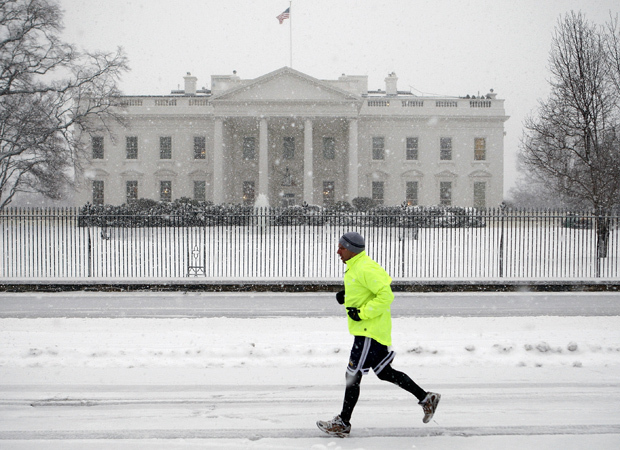 In Washington, Mayor Adrian Fenty declared a snow emergency but later lifted it. About 8 inches fell Monday morning at the National Arboretum in Washington, in Bowie, Md., and Arlington, Va., the weather service said. In contrast, much of western Maryland missed out on the bulk of the storm, except Frederick County, which had 6 inches of snow. 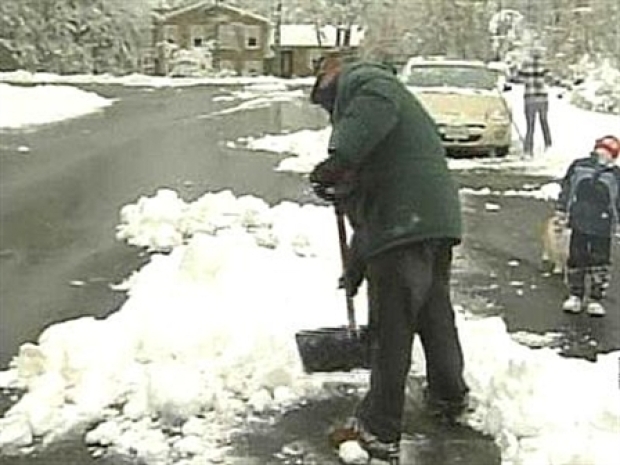 Southern Maryland residents are digging out after the storm -- even those still without lights. Much of Delaware received about 6 inches of snow, but Houston in Kent County had 9 inches by Monday morning. Delaware officials closed state and local government offices. Baltimore Mayor Sheila Dixon said the city was doing its best to keep primary roads clear as snow fell at a torrid pace Monday morning. About 2.5 inches of snow fell in Baltimore and up to 6.5 inches fell in Baltimore County. Take a trip all the way around the Beltway at lunch on a snow day. Air traffic out of Baltimore is getting back to normal after numerous weather-related cancellations. A spokesman for Baltimore-Washington International Thurgood Marshall Airport says the airport was unusually quiet Monday morning, but activity had picked up by Monday afternoon. Jonathan Dean didn't have exact figures on cancellations but said they were "widespread." Some flights were still delayed Monday afternoon because of bad weather in other cities, but Dean says the runways are clear. Crews worked through the night to plow and sweep the airport's runways and roads. BWI Thurgood Marshall Airport, Reagan National Airport and Dulles International Airport remained open Monday, although a number of flights were canceled or delayed. 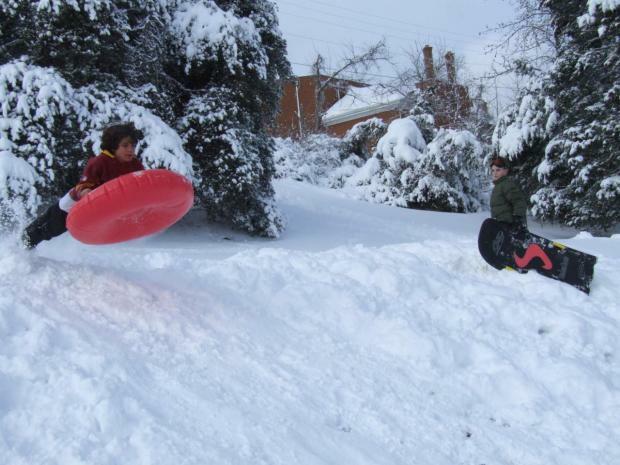 It's not often in the D.C. area that there's enough snow on the ground for kids to enjoy, so youngsters who had a snow day headed for their sleds. Salisbury-Ocean City Wicomico Regional Airport, which normally would have seven round-trip US Airways Express flights Monday, was forced to close shortly after 6 a.m. when temperatures plummeted and runways and taxiways iced over. "We are closed for only the third time in the 15 years I've been manager," said Bob Bryant. "It hurts my ego to do it." A lot of people took the day off Monday, which made commuting easier for those who had to work. AAA Mid-Atlantic received more than 2,600 calls for help by noon Monday across Delaware, the District of Columbia, Maryland, New Jersey, Pennsylvania and Virginia. More than half of the calls were requests to pull out cars stuck in snow. About 50 cars went in a ditch Monday after heavy snow storms on the Eastern Shore, Dorchester County, Md., Councilman Ricky Travers said. The minor accidents happened along a roughly 30-mile stretch of Route 50 between Easton and Vienna Sunday and Monday as almost a foot of snow fell. There had been no major crashes by Monday, according to Cambridge Police Department Lt. Wayne Bromwell. 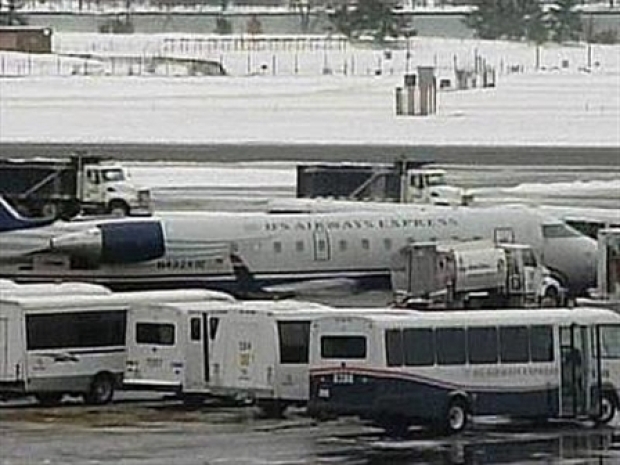 Snow caused many flight cancellations and delays Sunday, and Monday's high winds continued the trend. The winter storm provided a marathon ride for 140 passengers on an Amtrak train headed from Washington, D.C., to Newport News. Northeast Regional Train 99 left Union Station at 5 p.m. Sunday but was delayed for several hours north of Richmond because a CSX freight train derailed, Amtrak officials said Monday. The Amtrak train then encountered some switch failures, and workers had trouble making repairs because of snow on the tracks. The train, which originated in Boston, was stuck overnight between Richmond and Williamsburg and couldn't return to Richmond because of fallen trees, Amtrak spokeswoman Tracy Connell said. Power and heat remained on, and people were able to purchase food. 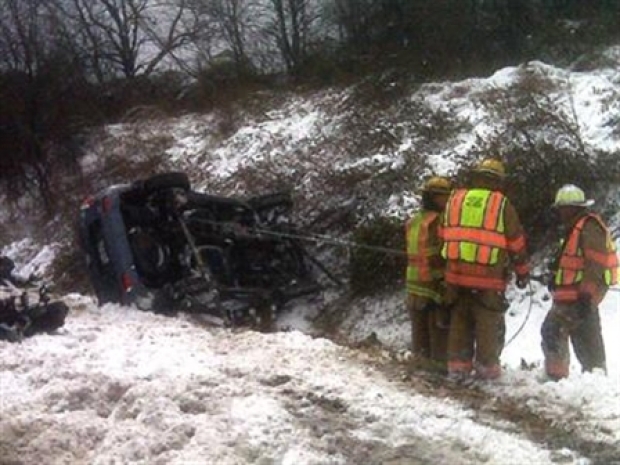 The winter weather created dangerous driving conditions in Prince George's and Montgomery counties Monday. The train also struck fallen tree debris on the tracks, damaging its engine. A freight-train engine was brought in to pull the train to Newport News, Connell said. The train finally made it to its destination shortly after 1:30 p.m. Monday -- nearly 16½ hours late. 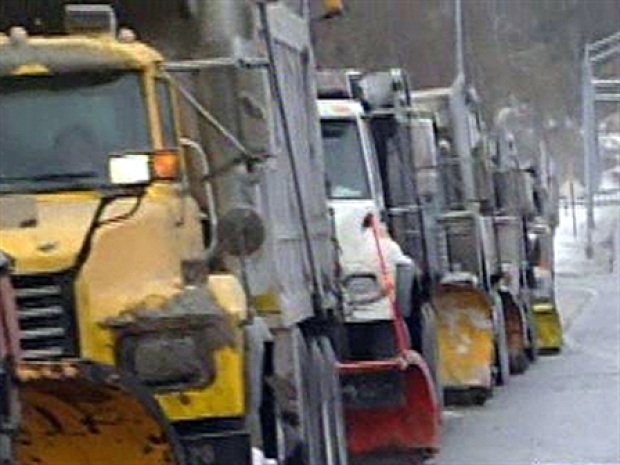 Virginia road crews prepare for continued icy road conditions Tuesday. Virginia Gov. Tim Kaine declared a state of emergency in response to the storm. It authorizes state agencies to step in to help local governments deal with the snow and the power outages, road closures and other problems it created. Counties, cities and towns were coping well with the most widespread winter storm to come through Virginia in eight years, Kaine said, but he wanted state agencies to be available to help if needed. The Virginia Department of Emergency Management staffed an emergency operations center to coordinate state response to the storm. The Virginia National Guard is on standby to respond as needed. After precipitation ended Monday, gusty winds began causing some drifting and very cold wind chills. The skies began to clear, and it will be much colder overnight. Wind restrictions are now in effect on the Chesapeake Bay Bridge (sustained wind speeds of 40-49 mph). House trailers, empty box trailers and other vehicles subject to strong winds are prohibited from crossing. High winds prompted officials to restrict several kinds of vehicles from crossing the Chesapeake Bay Bridge-Tunnel. Winds reached 47 mph, officials said. The restrictions barred motorcycles, large pickup campers, camper trailers, house trailers, vehicles with exterior cargo, empty tractor-trailers, small six-wheel trucks, rental trucks and school buses from crossing the span. There's also no towing allowed. In addition, wind warnings (sustained wind speeds of 30-39 mph) are in effect at the Francis Scott Key Bridge (I-695). Operators of house trailers, box trailers, motorcycles, vehicles with roof-mount racks containing cargo or any other vehicle that may be subject to high winds are advised to use caution while traveling across the bridge. Power has been restored to thousands of people in northern Virginia, but many southern Maryland residents are still in the dark. By 5:15 p.m., the Southern Maryland Electric Cooperative was reporting more than 7,000 customers were without power in St. Mary's, Calvert and Charles counties. St. Mary's appeared to be the hardest hit with about 5,000 customers losing power. Firefighters blamed the power outage for an early morning fire that ripped through two Waldorf apartments. Candles were left unattended in an upstairs bedroom, investigators said. 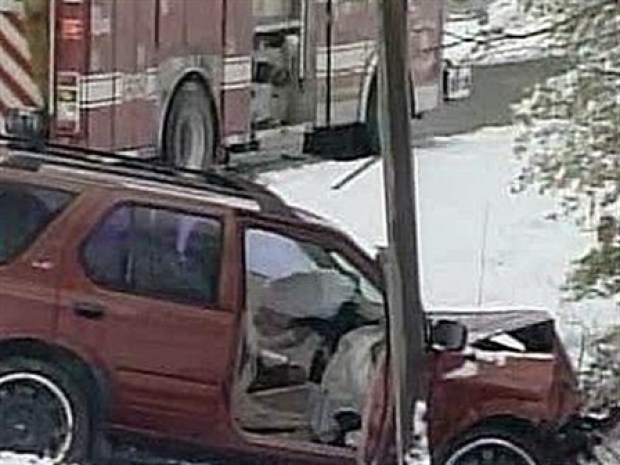 Two people were hospitalized. Baltimore Gas and Electric was reporting about 1,100 outages, mostly in Anne Arundel County. That's down from about 5,000 outages earlier Monday. In northern Virginia, Dominion Power is reporting power has been restored to all but 750 customers. The Richmond area was hardest hit, though, with about 35,000 power outages. In the Washington area, Pepco was reporting fewer than 1,000 power outages in Prince George's County. Though high temperatures could reach the 60s by the weekend, the snow won't melt Tuesday. Expect temperatures between 10 and 15 degrees Tuesday morning, with highs from the upper 20s to 35 degrees. Most of the region will see high temperatures hovering just below freezing. Check your flight status before heading to the airport. All three local airports are listed here. Send your pictures and video of the storm and its aftermath to isee@nbcwashington.com. Use Twitter? Keep up to date on the latest information by following us at twitter.com/nbclocaldc. Get more weather news here.